Judge Thompson served as U. S. District Judge for the Western District of Oklahoma from 1975 to August, 2007. During his nearly 32 years as a federal trial judge, he presided over a wide range of civil and criminal litigation. 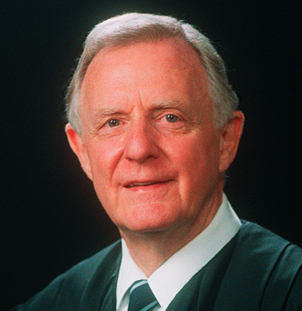 As Chief Judge, he was instrumental in establishing the court's successful Alternative Dispute Resolution program. Prior to his appointment to the federal court, he was in private practice for 15 years in Oklahoma City specializing in business litigation. A native of Oklahoma City, Judge Ralph Thompson was graduated from the University of Oklahoma with degrees in Business Administration in 1956, and Law in 1961. From 1966 to 1970 he served in the Oklahoma House of Representatives. He served 27 years, active and reserve, in the United States Air Force, in part as a Special Agent of the Office of Special Investigation, engaged in criminal investigations and counter-intelligence activities. He retired in 1987 as a colonel and was awarded the Legion of Merit. By appointment of Chief Justice Rehnquist, Judge Thompson served a seven year term as a judge of the United States Foreign Intelligence Surveillance Court, dealing with foreign espionage. Upon his election as the U. S. District Judge representative of the Tenth Circuit to the Judicial Conference of the United States, Chief Justice Rehnquist appointed him to the Executive Committee of that body, the policymaking arm of the federal judiciary. In 2013 Judge Ralph Thompson was inducted into The Order of the Owl, the University of Oklahoma College of Law Hall of Fame and also received the University of Oklahoma’s Honorary Degree of Doctor of Humane Letters, the University’s highest honor. As a further resource, Judge Thompson’s 32 year federal judicial career is reported in the biography Gentleman Jurist – The Life of Ralph G. Thompson by Burke & Dabney, which includes reviews of judges, lawyers, journalists and other commentators and authors’ selected cases of interest. Available through Amazon.com or www.oklahomaheritage.com . For 26 years, Judge Thompson has taught Trial Advocacy at Harvard Law School. He is the co-author of Bryce Harlow: Mr. Integrity, and Counselor to Presidents.